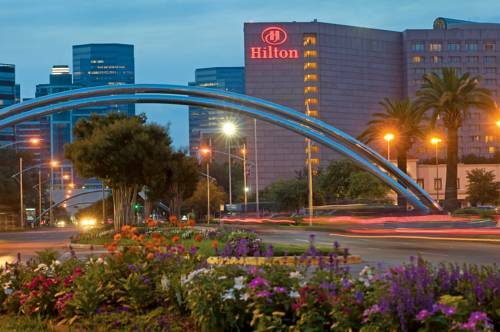 Experience the beautiful newly renovated Hilton Houston Post Oak hotel boasting spacious new guest rooms a new fitness center with modern equipment a sophisticated yet comfortable lobby and inviting restaurants. Located just one block from the prestigious Houston Galleria and in the center of the Uptown Houston business district our hotel offers a shuttle service for your convenience. Soak up the sun at our outdoor pool area grab a cocktail at The Brittany Bar or enjoy a tasty meal at The Promenade. We offer everything you need for a great stay in Houston. This Houston hotel is only 30 minutes from both the George Bush Intercontinental /IAH/ and Houston Hobby /HOU/ airports and a 15-minute drive from Reliant Park the downtown Houston business center Texas Medical Center and the George R. Brown Convention Center. Numerous oil and energy companies and worldwide corporate headquarters are in our backyard including AIG Apache BHP Billiton ExxonMobil Training Center General Electric Marathon Oil Company Shell Stewart Title Suez United Health Group. Minute Maid Park Toyota Center Memorial Park the Houston Arboretum the Museum District and Hermann Park. Our award-winning hotel offers 448 guest rooms including our 3 050 square foot Texas-sized Presidential Suite. All rooms have step-out balconies with impressive views of the Houston Texas skyline. Our Hilton Houston Post Oak hotel room amenities include coffee makers hair dryers iron/ironing boards two-line telephones wireless high-speed Internet access safes and remote control TVs. The hotel also features Complimentary shuttle service within a 3-mile radius of the hotel. wireless high-speed Internet access in meeting rooms and public areas. full concierge and 24-hour room service. fitness center open 24-hours daily. 24-hour business center. and 30 000 square feet of flexible meeting space including 23 meeting rooms. Java Jive proudly brews Starbucks coffee selection of breakfast pastries healthy snacks salads wraps - gourmet sandwiches. Conveniently located on the lobby-level adjacent to our front desk for our guests On-the-Go.